The Venice/Santa Monica/Marina del Rey area I’ve been hanging out in in town, just for reference. The town of Ojai, a town I have recently fallen in love with and want to go spend more time in. Actually, the guy I met here has also done a lot of world traveling and we’ve had lots of great discussions and sharings on experiences we’ve been blessed to have. One thing that I particularly enjoyed was our conversation on how to stay in amazing places all over the world… for FREE. We talked about some of the more universal aspects of it like having a certain mindset and vibrational alignment with the universe, as well as some more specific techniques like how to get people to eagerly invite you onto their sailboats, into lakeside mansions, and into areas that you would otherwise not be able to have access to. So this was the first place that I went camping. After paying the $35 (and having my interest sparked in figuring out how to do this for less), I drove in to my campsite and laid out my sleeping bag. After a wonderful sleep overnight in the park, I got up in the morning, packed up my stuff, and took a little walk, wanting to see where exactly I was. 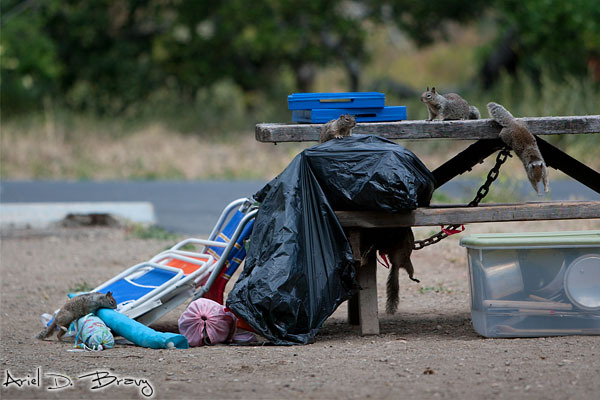 When I returned to campsite, the next night’s campers had already arrived and set their stuff down on the picnic table. I didn’t have to check out until noon and since it was still technically my site and they weren’t there anyways, I sat down and relaxed. There was a bunch of wildlife around so I grabbed my camera and started snapping away. I also noticed that a bunch of squirrels were around. In camping you learn about this thing called bearbagging. Basically the idea is that bears can smell really well and if they smell your food, there’s a chance they’ll follow their noses and go after it. If the food is in your tent with you, uh oh… To counter this, what you do is hang a bearbag. Basically you hang a bag from a branch way up in the air, at least a good 10-12 feet up or higher. Since bears can climb, you don’t want it near the trunk of the tree. You want it out away from the trunk, down the branch a bit. Well anyways, bearbagging doesn’t help with just bears. It also helps with smaller guys like raccoons and, as seen here, squirrels! At first when I saw the squirrels trying to get into the garbage bag, I went over to it (they scattered) and tightened the opening, figuring I’d do my part to help protect their stuff. Sitting back down, I grabbed my camera and happily observed. After heading out of Leo Carrillo, I went over to the beach and found some fun areas to play, in particularly this rock formation with waves rushing in and out of. Doing a little research on cheaper places to camp, I discovered a place named Topanga State Park which offers a $7/night campsite. You have to hike in a mile to get to it, so it’s not as popular as drive-up camping. Due to budget cuts here in California, it’s only open Friday and Saturday night. However, that’s two nights to do some camping away from the city, at a low price! You ready to go hike in and explore the Santa Monica mountains? I know I am! Let’s do it! Now I don’t know too much about botany and the names of flowers, but I passed by this older couple shooting pictures of the wildflowers. They knew more about the names and details of some of the local plants and started sharing some cool information with me. For example, in the picture below, the orange splotches are actually parasitic plants, and if you touch them you’ll find they’re actually wet! There were also a bunch of little dudes along the way, in particular the salamanders. They like to hang out on rocks and other warm places. (They must be cold-blooded.) When they scamper by and scatter about, the pitter patter of their feet are really loud. Although they have visual camouflage, they’re really easy to hear, both when they’re on open terrain or running through crackly bushes. This one had a stubby tail and let me get in really close to shoot this portrait. His (her?) body was only about 2 inches long or so. With tails, they look much longer. The tail is longer than the body itself! Along the salamanders you could occasionally find these horned lizards. This one was particularly cool. Moving slowly towards it to take its picture (as opposed to a predator-like quick strike) without blocking out the light of the sun (which usually causes animals to scatter as it’s like an instinctual sense of being overtaken), this lizard let me snap a few shots before trotting away. His camouflage is pretty awesome, isn’t it? Now one great thing that I’m quite fond of is variable weather and lighting and how those changes affect the scenery. Here’s the same location the following morning when a layer of fog had rolled in overnight. Similarly, here’s a shot of the mountains in the evening as the sunbeams shine in from the side as that fog begins to roll in. After camping that evening and having some wonderful conversations with fellow campers and a runner that went by, the next day I broke camp, brought my camping gear back to the car (pretty easy when it’s only a mile away), switched to my daypack, changed from boots to trailrunners, and went for a dayhike/trailrun. Where was today’s destination? A cool lookout called Eagle Rock. There were not only hiking trails, but also horse trails and mountain biking trails. We can all play! After a few miles in, we started getting close to Eagle Rock. Finally once I got up to Eagle Rock and climbed up to the top, I shot a quick video looking around. So on a whim one day, I pulled into a restaurant and found that they had not only your regular indoor seating, but outdoor seating on the sand, with seagulls flying all around. It was funny because every time customers would leave, a seagull would swoop in to nom on the food before someone came by to clean the table. It was common to see gulls walking on the sand next to you or sitting on an umbrella above you. After a delicious meal of macadamia coconut jumbo shrimp and a milkshake, a nice little splurge, I took a little walk to go explore some more. It’s always a treat to stumble across amusing finds like this sand wheelchair. I hopped in and tried it out. It wasn’t as bouncy as I had hoped (that’s probably a good thing actually…), but it was fun nonetheless. After this meal, I hopped back in the car and felt inspired to go check out this RV/tent camping area. I’m more of a backcountry guy who likes to go off into the woods, yet for some reason I felt like checking out this area and seeing what it was like. The area for tent campers was farther up near the top of the park so I drove my rental car up to the parking area there. It’s nice that this place also offered Wifi so you could hop online if necessary. As for the area I’d set up camp, you’re supposed to stop and check in before you enter the park, but the sign was blocked by an RV so I passed right by the office and drove right up to the top. Having done so, I got to see the various campsites available and found my absolute favorite one, right on the corner with a killer view. Although the coast of California runs primarily north-south, this area of the coast actually juts out to the side so this coast is actually somewhat east-west. Thus if you stand and face the water here, you’re actually facing south, and the west where the sun sets is off to your right. If you notice I don’t have just my tent set up without the protective rainfly. Since there wasn’t any rain in the forecast and I wanted to be able to see the stars through the mesh of the tent, I kept the fly off and slept in just the tent itself. Worked out well actually because the lady who ran the ashram was looking at getting the same tent so it was easy enough to show her mine. Hello RV’s! While here I took some time to stroll through the park and check out the RV’s, seeing what that lifestyle is like, what options are available, how it compares to tent camping and traveling in a car, and so on. Definitely a similar and yet uniquely different lifestyle! I’m thinking about a camper van trip to Cali and would like to be somewhere near the LA area. Living on the cheap is essential. I have a long range (50 mile) parabolic WiFi antenna because I need internet access for my work. I heard there are only two campgrounds in LA county that allow overnight stays for around $20 a night. Any other suggestions? Free or under ten would be great. Cool pics and vids. I know this is an old vlog but maybe you’ll be checking it. That sounds like a pretty awesome antenna. Have you been getting that kind of range in real life? I’m guessing terrain and weather must all be pretty important at those distances. LA county camping can be pretty pricey. There’s different apps you can download to your phone if you have one that give info on various campgrounds, including free options like Walmart parking lots, truck stops, and rest stops, if those count as campgrounds… If you’ve got a camper van trip. They’re great places to park. Heck, if you’ve got a camper, you can always park along the side of the road somewhere relatively safe (lots of people do that near the beaches), you can pull into a shopping center with a 24 hour fitness where it’ll be okay to be in all night, etc. Plenty of options if all you need is a safe place to park!